A great collection of general truth and pieces of advice. CUPERTINO, CA (PR Buzz) – March 14, 2017 – This week, many people from all around the world – Irish, non-Irish, and Irish by heart – celebrate St. Patrick’s Day with sumptuous food, drinks, and all things green. The roads are full of fun parades, marching bands, and fireworks; the pubs are filled with people wearing green top hats and fake beards; and the children are happily crafting their own Leprechaun traps, hoping to capture one of the red-headed rascals who love to pinch anyone not wearing green. This cultural and religious celebration is observed annually on March 17th and is named after St. Patrick, a real man born in around 385 AD. He is Ireland’s foremost saint who has been credited to bringing Christianity to the country. He is said to have used the shamrock, a three-leaved plant, to metaphorically explain the Trinity (Father, Son, and Holy Spirit). It is customary to wear shamrocks and/or green clothing or accessories during this jubilation. So, as our own contribution to this quintessential holiday, why not take a look and share some of the well-known sayings and idioms that the Irish has contributed the world? 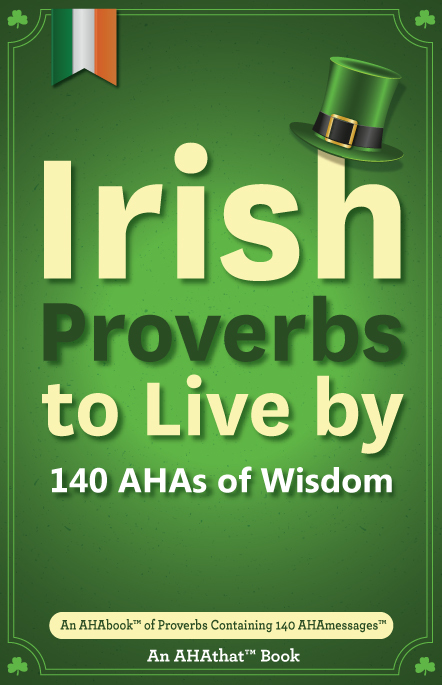 AHAthat’s “Irish Proverbs to Live By” is composed of 140 valuable proverbial quotes of inspiration that can be easily shared on Twitter, Facebook, LinkedIn, and Google+. “St. Patty’s Day is the time of the year when the rivers run green and the people sport green hats, pins, and shamrock-shaped sunglasses. It is also significant to share some inspiring Irish proverbs around social and this book has got you covered,” says Mitchell Levy @happyabout, The AHA Guy at AHAthat (http://AHAthat.com). Who doesn't like an Irish proverb? If you want to an easy way to share one or more of 140 Irish proverbs on social, go to http://aha.pub/IrishProverbs or just put the URL "aha.pub/IrishProverbs" in your status update and hit return. Dig out and put on your green hats and shamrocks or anticipate the day with an Irish whiskey with a simmering corned beef and cabbage, and don’t forget to share one or two Irish sayings on social. Celebrate St. Patrick’s Day while drawing some inspiration at the same time! AHAthat makes is easy to SHARE, AUTHOR & PROMOTE you. As the first AHAleadership (Thought Leadership) platform on the market, it allows you to 1) Easily build your brand by sharing others' quotes with proper attribution and 2) Show your expertise by creating your book in 8 hours or less and having others share your quotes. There are over 37k quotes from recognized AHAleaders that you can share in seconds for free. All content on the platform is curated by THiNKaha which has published over 800 physical and eBooks.